We won't see an election like this for decades again in this country. We are at a crossroads. They don't get more important and it's so important that you all get involved. Put your generational stamp on American politics. It may well be that polls show many Americans think the nation is heading in the wrong direction, but does that mean it is appropriate for a journalist -- in a national election year -- to declare that America needs to be “fixed,” clearly suggesting the country is broken? I looked around the Web extensively for more of what Williams said, June 8, in order to get a fuller quote to put it all in context, but came up empty. 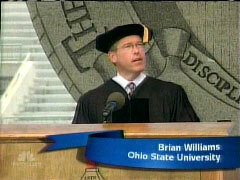 The Columbus Dispatch's Monday story didn't quote Williams, the Ohio State commencement page does not have text of the prepared remarks, the OSU press release page offers nothing, the student newspaper hasn't published since June 2 and the WOSU-TV channel 34 site has a page with video highlights of past commencements, but nothing yet from the latest one [UPDATE, Tuesday 5 PM EDT: video highlights (wmv and rm) now posted, with the entirety of the remarks from Williams.] And Williams has not posted anything about it on his Daily Nightly blog. The Internet is fantastic and it takes way too much of our time, so, with apologies, we need you all now to step up and every adult in this place has every faith that you're up to the job. You are today, as of today, as fearsome a weapon as the one they assembled during the Manhattan project in a similar place -- Soldier Field up in Chicago. You are the most fearsome weapon in the world. You are students in the United States of America armed with a newly-minted college degree from the Ohio State University. So pick one area: energy, politics, diplomacy, science, education, military, transportation. Start with climate. Something tells me this may be a challenge in the years ahead. Tomorrow's predicted high for Columbus is 220 degrees. Energy policy: Can you please help us find a way to get around without fuel in our tanks that comes from an enemy of this country? Politics: Pick a campaign. Campaign for McCain, campaign for Obama, campaign for the Libertarian, for the Vegan Party, but volunteer, get out there and campaign for someone. We won't see an election like this for decades again in this country. We are at a crossroads. They don't get more important and it's so important that you all get involved. Put your generational stamp on American politics. Dial in and pay attention, and I say that as part of a group we all have to start thinking and acting as one. There are, as of this week, 117 million blogs in the United States. One more time: 117 million blogs. And I stand here today as one of them. And what do most of us bloggers talk about? Us. And the problem is we need to start talking about us, all of us. We need to start thinking of us as the collective, the United States that we used to know. It's going to require a lot of work.